It is no secret that I have opened a site specifically dedicated to the documentation of words that – at the very least – appear like they are used, if not exclusively, then more frequently in the Province of Batangas. 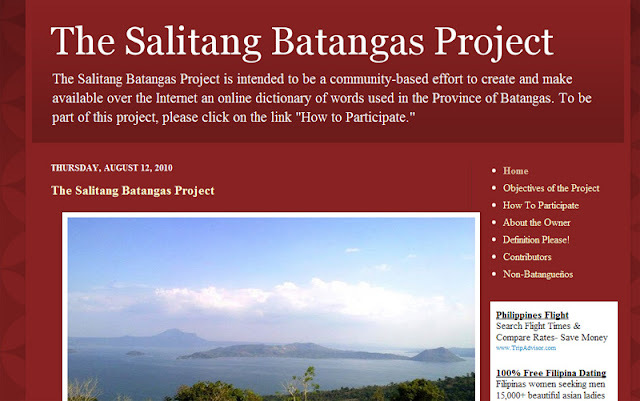 The site is, as if you need to ask, called The Salitang Batangas Project. I will be the first to say that this is by no means a unique undertaking. I used to have an officemate who collected these words in a computer file. He is more traveled around the province that I ever will be; so, I reckon, that file must have been quite extensive. It got corrupted, unfortunately. I am doing this from sheer curiosity, however; and have no pretenses whatsoever that this is an academic undertaking. My take on this is that, since the Tagalog I learned growing up was sufficiently different from what was being used in the community I was brought up in, I would involve that very community in the project. This is a task, needless to say, that has been made so much easier to accomplish because of the ubiquity of the Internet these days. One of the very first submissions was the word ula-ur, defined by the contributor as “to jab.” I had not heard the word before; but it seemed a credible contribution and the sort one would find in the outer fringes of the province. I did change the spelling to ula-or to allow for the colorful nuances in pronunciation that is so idiosyncratic of folks in the province. Those of you who are regulars to this blog know that the undeclared “flagship” story is “Funny Batangueño Words.” While many of you will remember the story for the conjugation of the word pisaot, there was also this brief mention of a word that had me in stitches the first time I heard it: ura-ol. I remember having defined the word, from the context with which it was used by the school driver who was telling me a story, as “to jam a part of the body painfully into something.” In the story, the driver was referring to his toe. Yesterday, I was walking out of the campus for a break with a colleague and was begging this colleague for any rare words when he bragged that he spent some of his formative years in Alabang; as though that was something I was supposed to be impressed with. He did mention – and with a cheeky, naughty look on his face – the word ula-oy. So, last night, I went back to my PC to make the appropriate addition of the variant. I reread the definition given to me by the contributor of the word ula-or, knotted my eyebrows a little bit, and then – as though a light bulb was suddenly lit above my head – I suddenly realized that ula-or was not only a variant of the word ula-oy but of ura-ol as well! It is a crazy old province, believe me you! And we Batangueños are a crazy old people! I am loving every moment of this project! I would never have made the connection if somebody had not written in about the word tibalsik. Roughly translated, the word means “splash” in English. That was exactly how I defined it in this pseudo-dictionary. The anonymous comment, though, stated that s/he had also heard the very same word said as tilabsik. The comment was correct, of course! I myself, I belatedly realized, use the two versions alternatively from time to time; and not that I am even conscious of when I use one version in lieu of the other! Some of the suggestions, I doubt, are even used exclusively in this province. These are younger contributors, of course. Tagalog words that have become archaic – and not just in this province – when mentioned by older people suddenly sound like they are uniquely Batangueño. I have been on this Earth, however, a bit longer than most – hence I would, more or less, have a better idea if a word is unique to the province or not. Take the word bonete, a small fluffy bread. I know many people in Metro Manila – if not all – know and use this word. Yet, this was submitted by a few contributors. Still, there are a few that one cannot deny are just plain and simply endemic to the province: tilâ, a condition of the rain stopping; liban, to cross the street, perhaps; or tipay, to button one’s shirt. Who’s to tell? I am discovering more and more that there are words that seem Batangueño but are also quite liberally used in neighboring provinces like Quezon. I had particular difficulty with the word luop. I first heard it from a former player who originally hailed from San Antonio in Quezon. That is, of course, next door to Batangas. The context of his usage was more akin to pining for a food; in that case, the closest Tagalog alternative was pananabik. But no; others said the word means to be treated by an albularyo. It took another contributor to settle the argument. If you pine for a certain food to the point that you get an upset stomach, then you go to an albularyo who will then burn the source of your discomfort until it goes away. So, there you have it; there is a reason for everything. It is finding that reason that makes this project so enjoyable to do; and that also explains why this is the first original entry in a few days. In case you have not realized it, the past entries have been recycles from my Facebook blog. I have been simply engrossed in this hobby called The Salitang Batangas Project. By the way… I am at a loss how to enter the word kaka. In old Tagalog – meaning, what we were taught in Panitikan and Balarilâ, the word meant tiyo or tio in Spanish. Some say that is just a term with which to address older people. One even naughtily said it is the name of a Brazilian football star. LOL! It has caught my imagination. I hope it will catch yours, too! If you think up anything at all, do me a great favor by submitting it at The Salitang Batangas Project The Salitang Batangas Project..